“The so called ‘war on drugs’ has caused increasing and unstoppable violence. Homicide rates are skyrocketing. 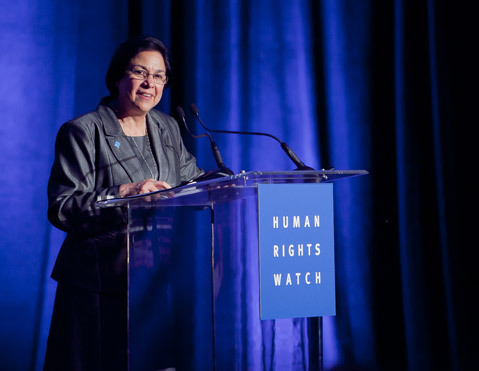 Human rights abuses have gone through the roof,” Sister Consuelo Morales told a packed banquet hall at Fess Parker’s Doubletree Resort in November. Based in the city of Monterrey, Mexico, an industrial and commercial hub two hours from the Texas border, Morales began “the only organization of its kind,” CADHAC (Citizens in Support of Human Rights), in the northeastern state of Nuevo León. It is a “state that has suffered a horrific descent into violence over the past two years,” declared Nik Steinberg, who investigates human rights abuses for HRW in Mexico. The city, once deemed the safest in Latin America, is now on the frontlines of the drug war and home to the notorious Zeta gang. Morales began CADHAC in 1992 when there were no human rights organizations to address an alarming rise of abuses including those in state-run orphanages. Their focus shifted in 2006 after Mexican President Felipe Calderon won office. With the U.S. endorsing his tactics, Calderon dispatched the military to combat the drug cartels. Morales and her staff at CADHAC are the only organization in Monterey working with the victims’ families to investigate these cases, Steinberg confirmed. Despite the threats and attacks in the past and her expectation of more to come, Morales spoke more about the families than herself. “The main challenge is to overcome the fear.” The fear, she explained, came from the drug cartels, the police, and the soldiers. Even those brave enough to step forward and “break the silence,” found no relief from the Mexican authorities because the military and civilian justice system rarely investigated the crimes. Working side by side with Morales in Monterey, Steinberg denounced the Mexican government’s lackluster investigations into the violence that is often blamed on the drug cartels. He reeled off a list of cases that HRW has documented in five of Mexico’s most violent states since 2006 indicating the participation of security forces: 170 cases of torture, 39 disappearances, and 24 extrajudicial killings. Calderon, he said, declared 35,000 drug related deaths between December 2006 and January 2011. Steinberg estimated there had been some 10,000 more this last year of which 90 percent were claimed to “belong to the cartels.” According to HRW’s research, fewer than 1000 of these cases between 2006 and 2011 linked to organized crime had been investigated by the Federal Prosecutor’s Office. “There’s no empirical basis” for the Mexican President’s statements, Steinberg asserted. The U.S. government has some leverage to pressure the Mexican government to reform their justice systems and maintain basic human rights standards. Since 2007, the U.S. has appropriated a $ 1.6 billion security assistance package to Mexico through the Merida Initiative to tackle organized crime. Steinberg explained that the bill authorized the US congress to withhold 15 percent of the funds each year until the State Department affirmed the country has met basic human rights standards in four areas. These include the investigation and prosecution of military and police officers accused of harming civilians. Although the Mexican government has failed to meet these standards every year since 2007, the funds have never been withheld. The tireless human rights advocate dressed in her simple gray nun’s frock laughed easily while talking to a group of UCSB students from the Walter Capps Center for the Study of Ethics, Religion, and Public Life at the University. She encouraged them to visit her in Mexico and see what life was like there.